Fantastic battery life, solid construction and a gorgeous exterior make up for a low performance ceiling in Acer’s 15-inch Chromebook for the masses. When compared to the best Chromebooks out there, this is an excellent value. Now that Chromebooks are starting to embrace hybrid designs, it’s a shame that the Acer Chromebook 15 sticks to the basics. There’s a lot to like here, but a convertible design or stylus support and a bit more power could have made this king of the Chromebook hill. Still, the Acer Chromebook 15 is a gorgeous, silent Chromebook with a beautiful 1080p display, fanless design and aluminum body. The 15.6-inch display is the largest available on a Chromebook, and it’s available in touch and non-touch versions. And, because it’s not a 2-in-1 laptop, like the Google Pixelbook or the Samsung Chromebook Pro, having a touch display is more of a luxury than a necessity. Where the Acer really puts itself above the competition is price and battery life. The Samsung and Pixelbook are both 2-in-1 laptops, with the Samsung being a hybrid Android/Chrome OS device, but both are significantly more expensive. While they have all-day battery life, they can't even come close to the staggering longevity of the Acer. The high-end version of the Acer Chromebook 15, a Best Buy exclusive in the US, is $399 (£279, about AU$560). Comparing that to the $499 (about £360, AU$630) Samsung and the $999 (£999, about AU$1,259) Pixelbook, makes it much easier to focus on what it offers rather than what it’s lacking. For that money, there are some definite trade-offs in performance. But, where it falls behind in power, the Chromebook 15 makes up its value in its phenomenal battery and gorgeous, giant HD screen. This is not the first Chromebook to feature a 15.6-inch, FHD display, but it looks absolutely lovely nonetheless. If you’re just after a bunch of display space, there are cheaper, less powerful 15-inch Chromebooks available with similar screens minus touch functionality. The Samsung Chromebook Pro and the Google Pixelbook are definitely more powerful, and the Acer Chromebook 15 isn’t a 2-in-1 laptop. 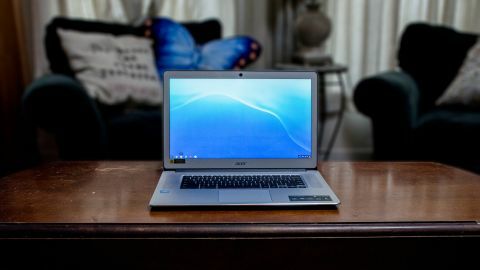 However, they’re so much more expensive, and they have other trade-offs, especially in battery life, making the Acer Chromebook 15 a solid value laptop. This isn't some chintzy, disposable plastic Chromebook. This is a sharp, business-ready machine that steals a lot of its design cues from the MacBook and other high-end business laptops. The gorgeous aluminum shell is milled on the edges, letting them capture and intensify light reflecting off the milled edges. It almost glows with metallic light. The chiclet-style keyboard is brightly backlit and feels excellent. Its keys are responsive, and the 15-inch design allows for excellent spacing between the keys. It's not a full-sized keyboard, but that would have been too crowded, especially given the upward-facing speakers on either side of the keys. The same milled-metal effect on the edge of the computer follows the edge of the trackpad, which is the only part of the Chromebook 15 that feels off. It lacks the solid feeling of the rest of the computer, feeling loose and clunky. Clicking the trackpad feels mushy and imprecise, and just touching it is unpleasant, moving slightly from the mere weight of a finger resting on it. At 4.2 pounds (1.95kg), Acer's Chromebook 15 is significantly heavier than either the Samsung or Pixelbook, both of which are just 2.4 pounds. It never feels heavy in spite of this. All that screen seems to spread the weight around. It's thin, too, easily sliding into a laptop bag.